The kitchen is so much more than a workspace. It’s a social epicentre, more often than not, that seems to attract friends, family, and everyone in between at one point or another. For that reason alone, you owe your kitchen a refresher every now and then. But there’s more in it still. 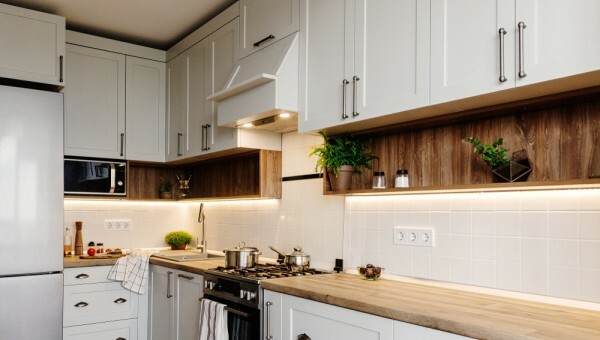 Kitchen renovations can add value to your home, improve its liveability, and make your meal preparation easier than ever. However, renovations can be tricky. That’s why we’ve developed this quick kitchen renovation checklist. If you know what you need to do, and when to do it, your renovation will run smoothly. First of all, let’s talk budget. Kitchen renovations are like any renovations: they can erode budgets before you know it. So developing a firm, early budget is always going to be the first step. Your budget will need to account for all costs, too. So take plenty of time to think it through. What could go wrong, what will you need, when will you need it, and how much will it cost? Those are just some of the questions you need to answer when creating your budget. And to help you answer those questions, see the next item on your kitchen renovation checklist: pros! Professional help is vital with all construction projects – big or small. The fact is, experience counts for everything at almost every stage of a kitchen renovation. There are so many contingencies to factor into your plans, and doing so without any experience is hard. Of course, that’s not to say it’s impossible. Everyone has to start somewhere! But it’s a steep learning curve, and you can expect to encounter a few problems along the way. It may sound counter-intuitive, but if you’re on an especially tight budget, professional help may be ideal. The simple reason for that is cost: with a professional quote, you know what your project will cost, and you can budget for it. What’s your timeframe? Ask your kitchen renovation specialist and add it to the checklist! A kitchen renovations checklist isn’t much use without a reasonable timeframe. After all, you need to give yourself time to tick each item off! That’s why it’s a good idea to liaise with your renovations expert and establish a clear timeframe. This should account for each stage of the renovation individually, too. That means starting from the start and working methodically. Each item on your kitchen renovation checklist should correspond with a stage of the renovation. A clear timeline also allows you to plan for what is likely to be a bit of a disruption to your ordinary life. If you’re living at home while renovating your kitchen, you need to know how long to expect the interruption. That’s why we’ve added time planning to our kitchen renovation checklist. Before you get started on your kitchen renovation, tick colour selection off the checklist. Colour selection is an important part of renovation planning, especially for kitchens. Kitchens normally employ a multidimensional colour scheme; there is lots of cabinetry to paint, after all. That means finding the right paints is a relatively long process. It’s best to get that process rolling early on, so you don’t find yourself waiting for custom paints towards the finish. Finally, have you chosen your appliances yet? Appliances are more than just functionally important; they also contribute to your kitchen appearance. That’s why they are an integral part of the renovation as well. Choosing them is important, and you should factor it into the design process. For more kitchen renovations tips & ideas, get in touch with Marshall Renovations today on (07) 3342 6675.